Here's my match report for day two, with quizzes marked with [number] and the answers given at the end of the report. 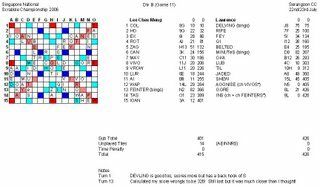 Was more than 150 points behind when I held a DEINRST rack with an open bingo line that required a front hook to OM. Remembered that STINTER was good, so I played STINDER* hoping that it would be good too but it was challenged off. My opponent scored big later with FANNER(50) down the TWS! L 299-511, -212. 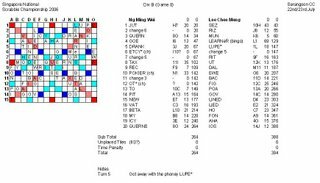 5W 1L (Accum spread +207). My opening rack had both the C and the H, so I opened with CEL with the E on the star, hoping to capitalise on the H on my next move. Alas, my opponent also had the other H and he put down THROW for 32 points underneath! Held a DEHISU? rack and missed the bingo in it. Put down UnHIDES* instead and it got challenged off! I also made a big mistake in my last move where I allowed Wei Min to capitalise his F on the triple letter score while trying to avoid the double letter score. L 315-430, -115. 5W 2L (Accum spread +92). Have been playing almost all the HCI high school players and Ming Wei is the last one that I met. 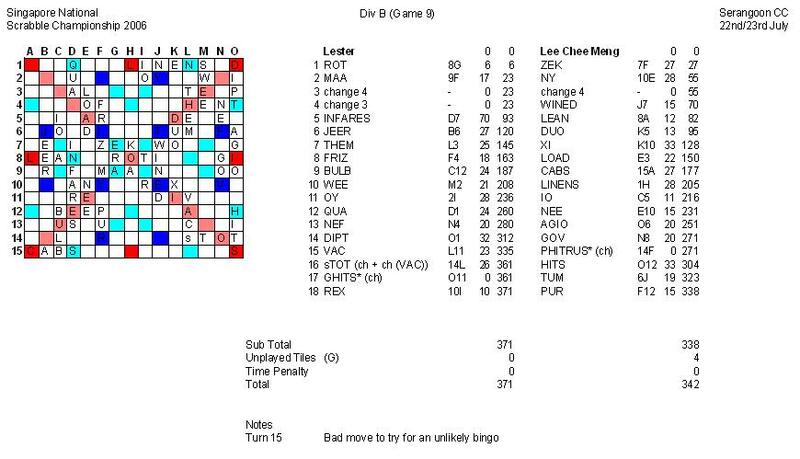 Managed to win by having a bingo early in the game and playing conservatively to close down the board. 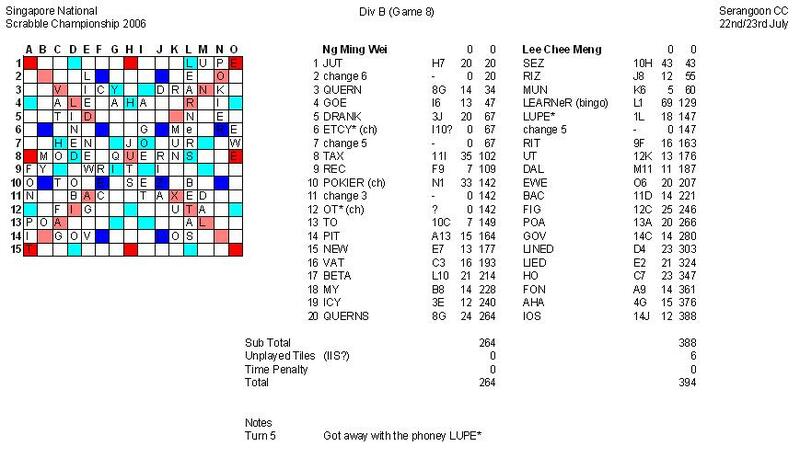 It also helped that I got away with a phoney LUPE* and challenged off the phoneys that my opponent put down. W 394-264, +130. 6W 2L (Accum spread +222). 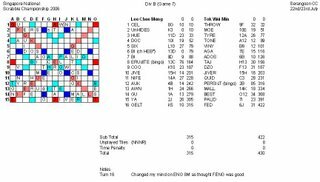 I was behind by 64 points with no more tiles in the bag and I was desparate enough to try a bingo with a HIPRSTU rack. Tried PHITRUS* but got challenged off! L 342-371, -29. 6W 3L (Accum spread +193). Start of the KOTH and I was playing Steven again. Was quite lucky to get two blanks on my rack. Got a couple of vowels, an S and two blanks. Thought of the 6-vowel bingo but forgotten how it was spelt. Somehow the "old McDonalds had a farm" song kept ringing in my head. 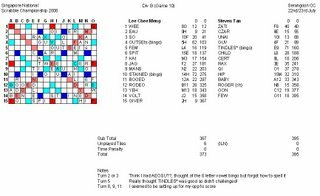 Bingoed with OUTSEts(62) later and my opponent bingoed with TINDLES*(71). Didn't realise that TINDLES* was a phoney until much later! He managed to score very well whenever I tried to open up. 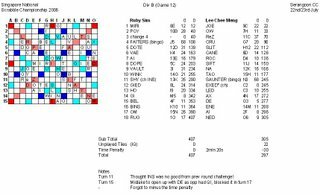 Lost even though I had a second bingo with STAINED(72). L 373-395, -22. 6W 4L (Accum spread +171). Started with COL and my opponent put down DELVING(75). Wanted to challenge as I thought I saw DEVLING, but stopped myself as I had a better look at the board and Lawrence's surprised reaction. 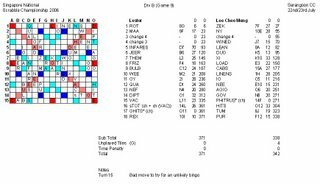 He had another bingo with MINUTeS(82). 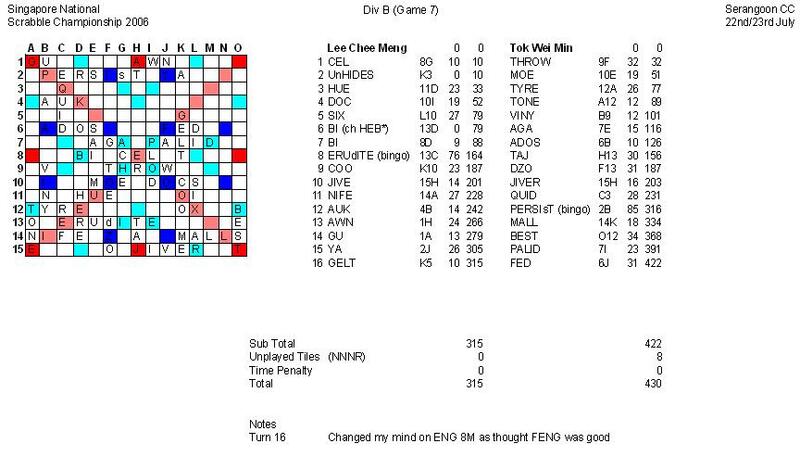 Was almost 150 points behind at one time, but managed to catch up a bit with FEINTER(82) towards the end. L 375-426, -51. 6W 5L (Accum spread +120). 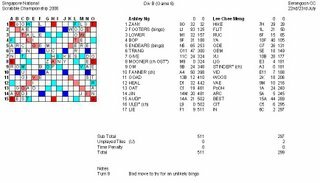 My opponent bingoed with FAlTERS(68) while I bingoed with SAUNTER(68). Played badly towards the end. I phonied with EXED*, almost didn't trap Ruby's "Q" and went overtime for more than 2 minutes. 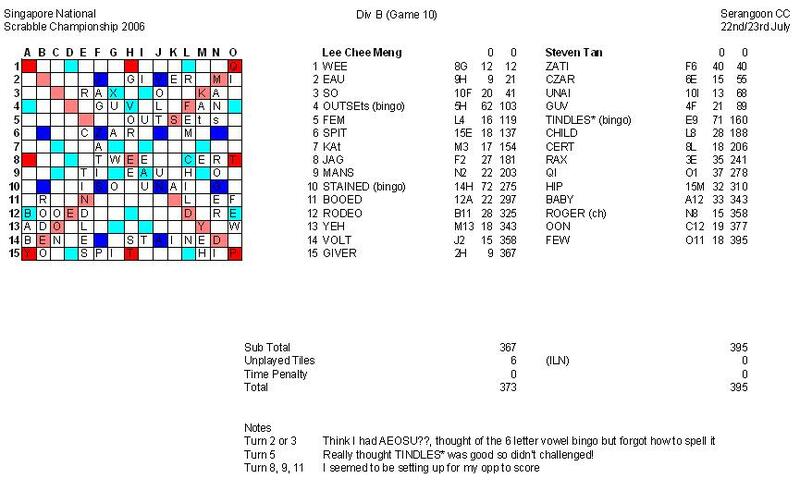 Both of us forgot to include the time penalty in the score sheet though which was spotted by Seow Kie. L 327-407, -80. 6W 6L (Accum spread +40). In between games, I had fun peering behind the Tournament Director's shoulders to see the results being churned out. Saw this very cute little girl beside the TD asking him who is "ZZ Bye" towards the end of the game! 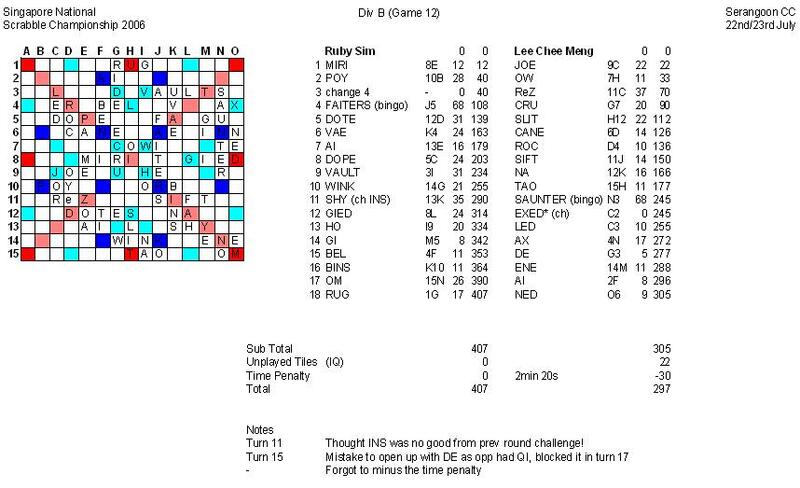 Hmm, one of the mysteries in competitive Scrabble! 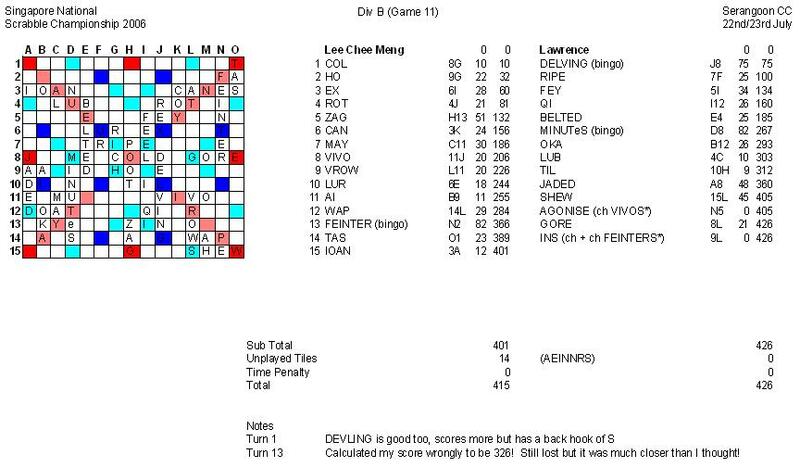 Quite disappointed with the many sub-optimal plays that I made and the phoneys that my opponent got away with! 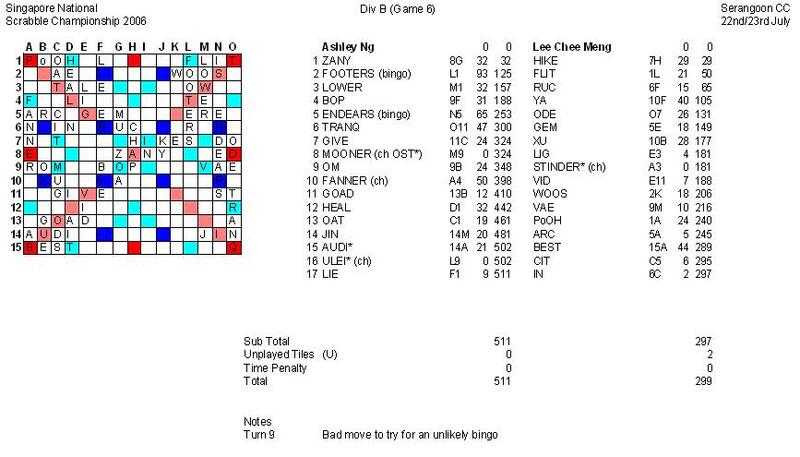 Must learn how to keep my cool under competition pressure and not be tempted to any how try for bingos in the future! Oh, TINDLES* is no good!! Could have won Steven if I challenged him off! Lawrence and I checked DEVLING after the game and we found that it was good. The quiz answers are so light, even when highlighted ! It was (L)OAN. The L is a blank, so it looked like an I.